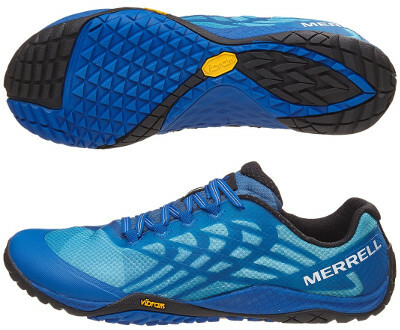 Merrell Trail Glove 4 are neutral trail running shoes. After few years the Merrell Trail Glove 4 reaches the market with interesting changes while still true to its barefoot soul for those loving minimal shoes and natural running. Although minimalist trend is no longer mainstream (with maximalist in full swing), Merrell keeps manufacturing high quality (everything is synthetic so it is vegan friendly), zero drop and glove-like fit and expects current Trail Glove 4 to be a best seller. Barefoot experience has been improved with fused TPU overlays instead of sewed ones like in predecessor Trail Glove 3 to prevent chafing. Several straps going from footbed to eyelets provide a secure and snug fit with custom pressure from traditional laces deprecating old Omni-Fit™ system. Breathable mesh lining is treated with M-Select Fresh™ antibacterial technology to provide a better experience when running sockless. Midsole maintains the 4 mm CMEVA for long-term minimal cushioning and TrailProtect™ pad for underfoot protection. What has been improved is the outsole made in cooperation with renowned manufacturer Vibram®. It not only features new material (TC5+) for enhanced grip and durability but also new configuration with 3 mm triangular lug pattern in the forefoot and kind of arrows in the rearfoot to increase traction on every terrain.